Wendy, how do you describe your work? I am a jewelry artist. 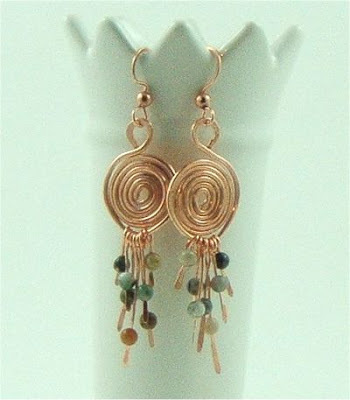 I wire wrap semi-precious stones and handmade art glass into women’s jewelry. My designs are unique but simple, jewelry that everyone can wear. When I was searching for a business name, I knew that I wanted to include the word “bead” in it since back then the search engines put much weight in the name of a webpage or a business. I also wanted a word that would be unique to me so that if people were googling me, it would be easy to find me. So I took two email handles that I was using at the time, indigo and skye, and put them together. The blue skies connotation seems to put a smile on my customer’s faces and the name stuck. I even answer to indigo or indigoskye on occasion! I start by going through my stash of stones and picking out combinations that appeal to me. Then I just put them together. Sometimes I start with a wire technique that I want to use and then put it with my stones until a design emerges that I find pleasing. I never write anything down or plan…whatever flows from my pliers is what I make.I sometimes play music, but usually I put cooking and gardening shows on the TV and let it play in the background. If a good recipe pops up, I stop and watch for a few minutes and then get back to work! I tend to work in small chunks of time and alternate my tasks. An hour or two on the computer for marketing or minding online sales, an hour or two with the pliers, an hour or two at tending to the house or running household errands. 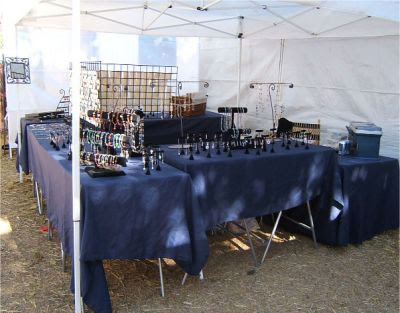 The only time that I am focused on jewelry for a long period of time is when I’m in my booth at a venue, and then it is jewelry for a good 6 to 8 hours at a time since I tend to make things in my booth in between sales or make custom orders in the night. The only design training I had was as a florist wannabe. I was the co-host of a television program on flower arranging. The program was the florist teaching the viewers how to be a flower arranger and it was my job to ask questions to prompt him into the next step in a natural manner and to assist with the flower arranging as the cameras rolled. Over the course of a year or two of production, I learned many design concepts from this man and later discovered that many of the principals of flower arranging also hold true in jewelry making. At the time, I didn’t do crafts at all. I was too busy teaching high school English during the day and doing television production at night and on weekends. I took up jewelry for the first time during my wedding preparations. I made my own bridal veil and the jewelry for my bridesmaids in order to save money on our wedding. I enjoyed the jewelry making and decided to sell it part-time after the wedding. I found that jewelry got busy during TV production’s slow time so the two professions merged together well time wise. However, as the years went on and I started to do bigger jewelry venues, I discovered that jewelry was more profitable to me than freelance TV production and I started to concentrate more of my time there. I still like production and writing, but now production is more my hobby and jewelry my profession, the exact opposite of what it was a decade ago. 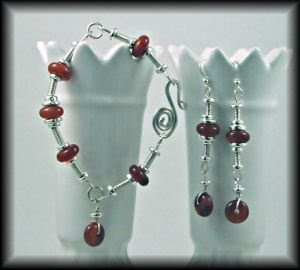 Currently, after eleven years of selling my jewelry on the festival circuit, I am starting to take formal lessons in jewelry making. My favorite instructor is Connie Fox and I am simply in love with Eni Oken’s wire wrapping tutorials. I am also taking fabrication lessons via CD produced by an instructor named Don Norris. I’m not sure what my jewelry is going to morph into, but it has been an exciting time for me. I am grateful to these instructors for sharing their time and expertise with me. My hands, eyes and my heart. Everything else is replaceable. Either you are an artist and MUST create, or you are not. Inspiration comes from everything around me in the world and from within. 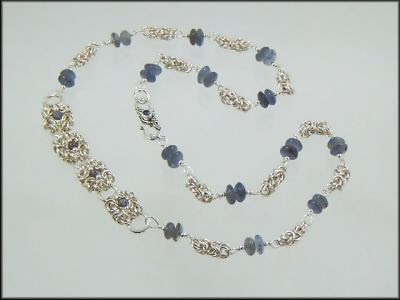 There are times when I feel blue about jewelry making. When I have a bad show and barely break even, when I apply to venues I would dearly love to enter and am told “no jewelry need apply” or have people come into my booth and try to tell me how to run my business. Sometimes being alone with only my dog for company in the studio can press in on me too. I wonder what the heck am I doing with my life. It is then that I ask myself, is there a single profession on the planet when you don’t have days like this? I don’t think that anyone has it easy out there. I just remind myself that overall I love being my own boss, making my own destiny and creating things that bring a smile to people’s faces. If that is not enough, what is? Be willing to take risks. Find a mentor to help you figure out what reasonable goals to set for yourself. Ask questions and be willing to listen. Take lessons and improve your technical skills. So that we’ll know a little more about you personally, what takes up the majority of your time besides your art? Gardening and cooking. I grow exotic hot chile peppers and use them to make powders for my cooking and I spend time tending my roses. I love to provide homemade meals from scratch to my husband. Most of my meals take an hour or two to cook so I spend a lot of afternoon time in the kitchen. And Wendy, what’s your favorite comfort food?! My favorite comfort food is just about anything that can come out of a crockpot. Crockpot cooking is one of my favorite methods since it is one of the healthiest and easiest ways to cook.